guys only weekend How long has it been since you've gotten away from it all–just you and the guys? The Fox Cities offers great getaway options whether you're looking for athletic activities or a e long relaxing weekend away. The outdoor sports enthusiast will definitely love the Fox Cities. Many of our communities offer great locations to land the BIG fish. Along with terrific fishing spots, there are many opportunities to enjoy other water activities such as boating, ting, kayaking, canoeing or jet skiing. If you've come to the area without any of your outdoor sports gear, don't worry. The Fox Cities is home to Scheels ls All Sports. Located inside the Fox River Mall, Scheels is home to the top-of-the-line name-brand gear you'll need for whatever sport you play. After your stop at Scheels, grab your golf clubs and head to any of the challenging public c golf courses available in the Fox Cities. Whether you play for eagles or bogeys, there is a course to challenge every skill level. When you're ready for dinner, your options are endless! The Fox Cities offers a wide array of dining options to tackle even the toughest palate. From Chinese, Greek and Italian to well-known chain restaurants, your taste buds will leave satisfied. Looking for competition? There is plenty of that to be had in the Fox Cities. Players Choice and BadgerSports Park offer plenty of competitive sports from batting cages and go-karts, to mini golf. When you and your buddies es are ready for nightlife, we have that covered too! There are plenty of sports bars in the Fox Cities where you can an sample great beers, challenge your buddies to a game of pool or kick back and watch the big game. Looking for or some entertainment? Skyline Comedy Club and Knotted Piano's are two places you'll want to put on your trip p itinerary. Skyline Comedy Club features great national comedy acts to ensure a hilarious time. For more laughter, head to Knotted Piano's for some dueling piano's entertainment and fun. 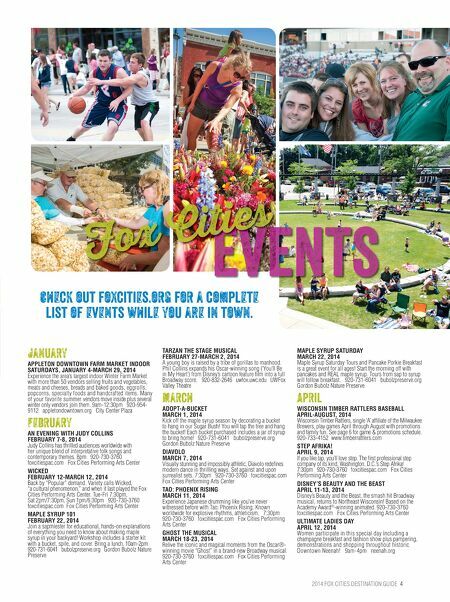 Start your planning today at foxcities.org! Girls only weekend If it's time for a me-cation, then it's time to head to the Fox Cities, Wisconsin's Shopping h pn Place. The Fox Cities wide variety of shopping, fine dining, creative and performing arts will give you and your friends the perfect opportunity to relax and re-energize. The Fox Cities will quickly become your favorite shopping destination. The Fox River Mall is home to 180 stores including favorites such as JC Penney, Macy's, DSW Shoes, Pottery Barn, White House Black Market and many more. But the mall is just the beginning. Many of our downtowns have great, locally-owned boutiques and shops where you will find everything from clothing to specialty pet accessories. After a long day of shopping, your feet and body will thank you by making a stop at any of our amazing spas. A relaxing massage or a much-deserved manicure/pedicure, will allow you to check "pampered" off of your getaway checklist. After an afternoon at the spa, jump in the car for a short drive to Freedom. Once there, you will find a delicious stop that will not disappoint! Kerrigan Brothers Winery is home to over 20 varieties of fruit wines using locally sourced fruit. Purchase a bottle and glasses and grab a seat on their outdoor patio to enjoy a sunny day. Lastly, you'll want to take advantage of the great dining and nightlife atmosphere in the Fox Cities. There is a wide array of dining options to satisfy every palate. End your weekend with a fantastic Broadway production at the Fox Cities Performing Arts Center or catch some live music at one of many local hot spots. 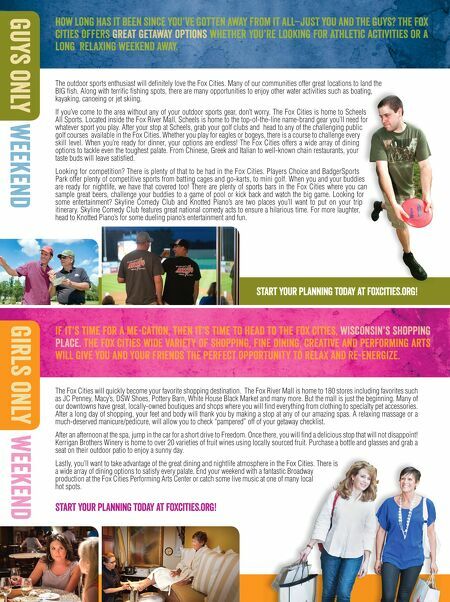 Start your planning today at foxcities.org!